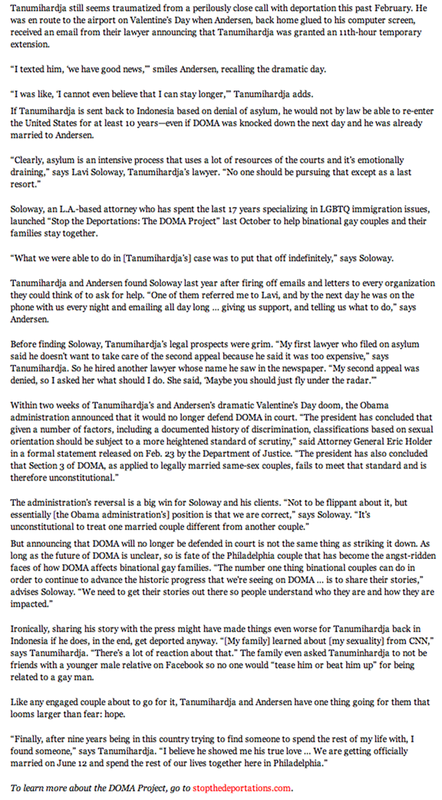 Readers of this site will remember the victory achieved by The DOMA Project's Stop The Deportations campaign in the case of Anton Tanumihadja earlier this year. (See "Deportation Delayed For Philly Couple," Philadelphia Gay News and media coverage of Anton and Brian's fight against deportation on CNN and NPR, MetroWeeky, and Queerty). Anton was scheduled for deportation on Valentine's Day when he reached out to us at the beginning of February for help. His partner, Brian Andersen, and the staff at the Gay and Lesbian Alliance Against Defamation (GLAAD) worked hard diligently with Stop The Deportations to bring their plight to national attention. After successfully winning a reprieve from deportation, Brian and Anton have continued to plan their future together. In an extensive interview with the Philadelphia Weekly, they disclosed for the first time that they will marry this weekend in Washington, D.C. We congratulate Brian and Anton on their marriage and assure them that we will continue to fight to keep them together in this country. Here's the full article from today's Philadelphia Weekly.